Angel investing has long been an important source of capital and mentoring for new and growing businesses, bridging the gap between individual (friends and family) and institutional venture capital rounds of financing. An angel can be a wealthy individual or a collection of individuals in a fund willing to invest in a company at an early stage in exchange for an ownership stake, often in the form of preferred stock or convertible debt. Angels are considered one of the oldest sources of capital for start-ups. Over the past several years, angel investors (AIs) have been formalizing in response to both growing demands and complexity; there now exist a fair number of angel investing groups to seek funding. See the most current report from the Center for Venture Research, a multidisciplinary research unit of the Whittemore School of Business and Economics at the University of New Hampshire, on angel investing. The reports provide an excellent overview of the activity of AIs. These data indicate that the angel market appears to have reached its nadir in 2009 and has since demonstrated a slow recovery. Industrial/Energy has shown a continued increase since 2010, reflecting a growing interest in clean tech investing by AIs. Retail and Media have solidified their presence in the top six sectors, mainly due to investing in social networking ventures. The yield (acceptance) rate is defined as the percentage of investment opportunities that are brought to the attention of investors that result in an investment. In Q1,2 2011, the yield rate was 15%, continuing a stabilization in yield rates that began in 2008 (10%) and continued in 2009 (14.5%) and Q1,2 2010 (12%). These rates indicate a cautious approach to investing, reduces the concern of an unsustainable investment rate, but also reflects the difficulty for entrepreneurs to secure angel funding. 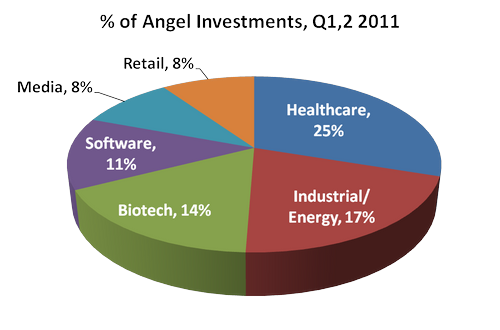 Angels, like other sources of venture capital, are derisking their investments by choosing to invest in fewer biotech programs and decreasing the amount invested. The competition among biotechs and pharma startups for AI support is greater than before; it is critical to have the prospectus well defined, designed, and appealing when presenting to AIs. Contact Partners in BioPharma Consulting to see where we can assist you with developing the optimal product profile and materials for discussions with angels or other investors. We can manage a project from beginning to end, provide contracted support, or suggest talented experts from our alliance partners to help you achieve your goals. Click here for an outline of services that can be designed to meet your needs. Angel Resource Institute: a charitable organization devoted to education, information and research about angel investing for investors, entrepreneurial support organizations, university faculty and students, and policy makers. Available here. Angel Capital Association (ACA): the North American trade association of angel groups and private investors that invest in high growth, early-stage ventures. The Angel Capital Association provides professional development for angel groups, family offices and private investors, delivers services and benefits to support the success of ACA member portfolio companies and serves as the promotional voice for the North American angel community and the public policy voice for the US professional angel community. Available here. Center for Venture Research: a multidisciplinary research unit of the Whittemore School of Business and Economics at the University of New Hampshire. The Center's principal area of expertise is in the study of early stage equity financing for high growth ventures. The Center for Venture Research, since its inception in 1984, has undertaken and published numerous studies in the area of early-stage equity financing of entrepreneurial ventures. Available here. Silicon Valley Bank: one of “the premier banks for technology, life science, cleantech, venture capital, private equity and premium wine businesses. SVB provides industry knowledge and connections, financing, treasury management, corporate investment and international banking services to its clients worldwide through 26 U.S. offices and seven international operations.” Available here. Mid-Atlantic Diamond Ventures (MADV): “provides support and connections to capital to early-stage innovation and knowledge-based businesses seeking Series A financing. It is the only year 'round venture forum program in the Greater Philadelphia area (four forums annually), and serves emerging firms throughout the Mid-Atlantic region. The program is also one of the largest by number of clients served: about 40 high-quality entrepreneurs in life science, information technology and physical sciences each year.” Available here. Robin Hood Ventures: a group of angel investors, focused on early-stage, high-growth companies in the Greater Philadelphia region. They help entrepreneurs build great companies, providing capital, mentoring, expertise and connections to help companies reach their potential. Robin Hood generally invests $250k to $500k, and collaborates with angels, institutions and VCs in their network. Available here. “What’s an angel investor?”, WSJ, April 18, 2010, available here. “10 Things Start-Ups Won't Tell You”, SmartMoney, February 6,2011, available here. The Science Center: “Founded in 1963, the Science Center is the oldest and largest urban research park in the United States. We support technology commercialization and technology-based economic development on our campus and in the Greater Philadelphia region. Our 31 nonprofit shareholders include many of the distinguished colleges, universities, hospitals, and research institutions located throughout Pennsylvania, New Jersey, and Delaware.” Available here.